Shane Colton: The epic journey of the spinning disks of doom. The epic journey of the spinning disks of doom. DO NOT TRY THIS AT HOME...OR ANYWHERE. So that takes care of the donut holes, but then what do you do with a bunch of 1/4" steel donuts? Pretty useless, right? Not if you believe in conservation of usefulness. 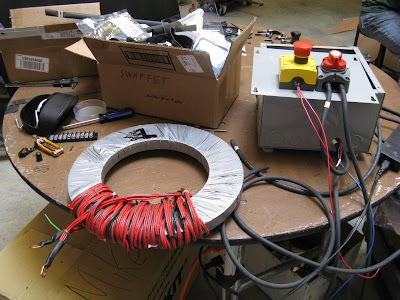 After looking around for a microwave transformer or something to smooth out some extremely high battery charging current, also for an EVT project, I remembered these donuts. 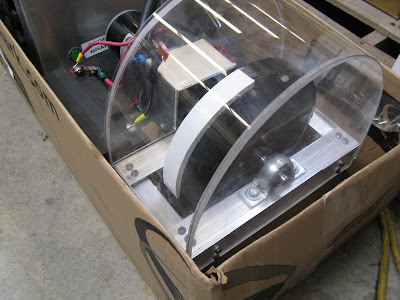 Toroidal inductor core! Also surprisingly less dangerous than the previous usage. In any case, the spinning disks of doom have found new homes.